You don’t see this perennial from the middle east very often in our gardens. Its a great, low water long lived plant with dramatic, showy flowers. 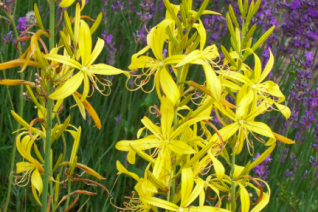 Spikes to 4′ tall are clouds of large starry yellow fragrant flowers. Blooms appear in May and June and are showy for weeks. Grassy blue green leaves form a clump at the base. Rich, well drained soil with little to no summer water once established. Mass for a very showy effect. Remove spent flowers and you are left with relatively good looking low arching blue green leaves. Must have full sun and a bit of patience to bloom. We try to sell them in bloom to avoid the wait. Moderate deer resistance. Winter deciduous. Long lived.